Submitted by Abbie Jefferis, @ollergy — Food allergies are tough. There is no way around that. I'm really thankful to have found a whole community of can openers for us that helps make the journey easier. Our son Ollie is three years old and is severely allergic to peanut, tree nut, sunflower, sesame, milk, egg, and legumes (except soy). He is contact allergic to some of these. We're really fortunate to have family near and far that support us. Ollie's aunt is his daycare provider and takes amazing care of him. His young cousins know to wash hands and not share food and the three of them tell others to do the same. Ollie doesn't really eat out anywhere other than one restaurant, but we're really fortunate to have immediate family members that know how to cook safely for him. They are constantly texting us photos of labels to check ingredients or share a new safe product they discovered. Even at other people's birthdays, the dessert is always safe for Ollie! We are so fortunate to have family that goes to such great lengths to care for Ollie. It was especially evident recently when my husband had to have an emergency appendectomy and many family members stepped in to help. I felt comfortable being at the hospital, not at all worried about what Ollie would eat and who he was with. We were really sad to miss the Food Allergy Heroes Walk in Boston, but friends and family rallied around us none the less. A few made the trip to Boston to represent Team Ollergy and others continued to work on fundraising via social media. 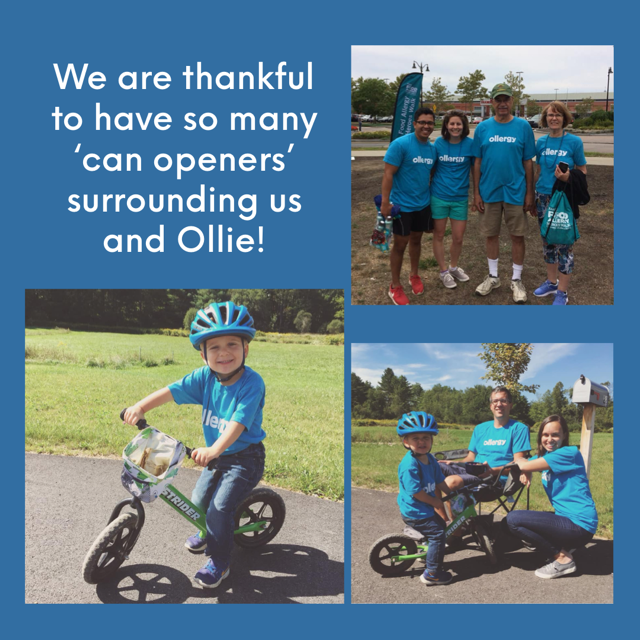 We are so thankful to have so many can openers surrounding us and Ollie. He's surely a can opener himself: always positive and matter of fact about his allergies. We hope this never changes as he gets older. For more information about Abbie's advocacy, check out her blog where she shares ideas, products, recipes, meal plans and more to help other food allergy families and spread awareness, www.ollergy.com, or on Instagram at @ollergy.